PSA allegedly confirms the Cobb cut is a fake, but done by hand? -After demanding apologies from all those who called out his PSA-authenticated and slabbed Ty Cobb cut signature as a sophisticated, laser copied forgery, Donavon Arabie, told some fellow collectors that he sent the cut back to PSA for examination and said that the authentication giant allegedly says it was the creation of a “Amazing Forger” and done by hand and not machine. Aribe says PSA refunded him his authentication fees and sent the item back to him after it was pulled from eBay by its fraud division. -Richard Simon has requested to examine the raw Cobb forgery, hoping to clear things up with a physical inspection of the actual item. Simon says he is anxious to view the original in person and has offered to reveal his findings on Net54, but Aribe has told collectors he plans on destroying the Cobb forgery instead. He says he’s going to burn it. We hope the FBI gets to him before he lights the match. -Arabie says he purchased the bogus cut at an “estate sale” and discovered it in-between some old Goudey cards. So beware collectors of this “Amazing Cobb Forger” who secretly drops his handiwork into estate sale lots, so that unsuspecting collectors can, in turn, turn a nice profit. -Net54 took an informal poll that had 38 people correctly identifying the Cobb forgery as a direct copy of Ron Keurajian’s authentic original, while only five people believed it was an entirely different item. So far, no statement has been issued by Joe Orlando or Steve Grad to PSA/DNA customers with slabbed cuts in their collections. How will they ever know their cuts are legit considering this Cobb that got by their experts? As long as the cuts slabbed, do they really care? -Heritage’s sale of stolen artifacts continued with their offering of a rare Nap Lajoie Horner cabinet stolen from the National Baseball Library. After we reported it for Deadspin, the auction house removed the item from the sale, but will it really make its way back to Cooperstown? Still no comment from the Hall. -Heritage is also offering another item believed to be stolen from the New York Public Library, a signed Harry Wright telegram. At least its really signed by Wright unlike another telegram authenticated by JSA last year that was signed by a telegraph operator. -Heritage’s auction preview featured many items that didn’t make it into their Spring sale, including the forged-mint Ty Cobb single signed ball we also wrote about for Deadspin. 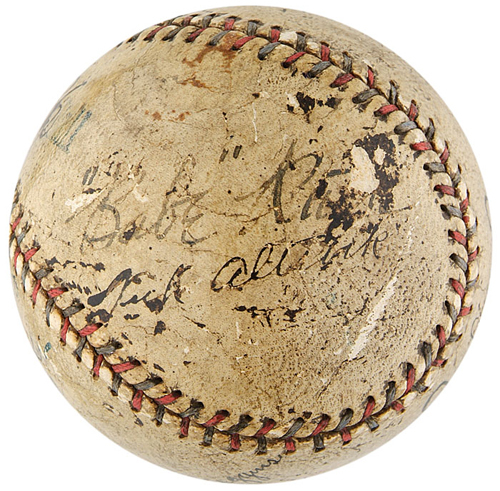 Another Cobb ball, in beat-up condition and appearing to be the work of the same forger, also vanished from the sale. We wonder how many other items came from the consignor of both of those balls. 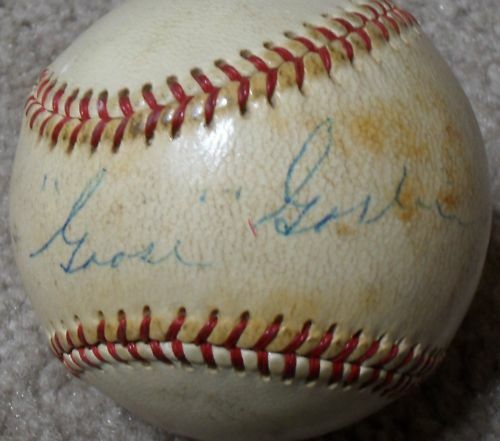 -eBay’s removal of the JSA-certed $80,000 Walter Johnson ball from eBay a few weeks ago, was followed by the fraud division’s withdrawal of a $29,999 Goose Goslin single signed ball also due to “authenticity issues.” Spence has a checkered history authenticating signatures alleged to have been signed by Goose, especially yellow Hall of Fame plaques as reported last year on Autograph Alert. 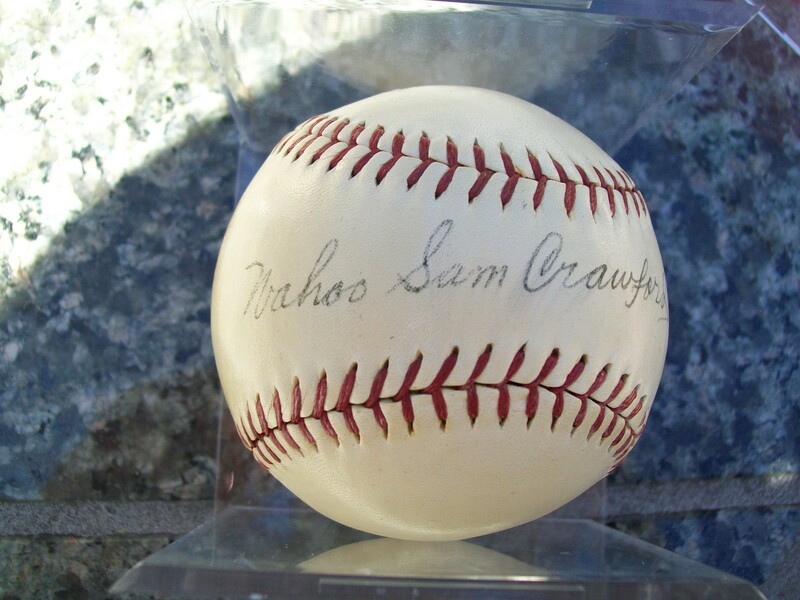 eBay removed this Drew Max certed Sam Crawford ball due to authenticity issues. - Pawn Stars expert, Drew Max, also had several of his LOAd items removed from eBay by the fraud team for additional authenticity issues. Single signed balls alleged to be signed by Rogers Hornsby, Wahoo Sam Crawford and Babe Ruth vanished from the eBay website last week. How long before Max joins the ranks of the so-called authenticators on eBay’s “Banned List”? -eBay has also removed PSA-certed copies of Christy Mathewson’s “Won in the Ninth,” which are believed to feature secretarial signatures of the Hall of Famer. -Controversy is brewing over the grading of some high-end T-206 baseball cards appearing in the Spring sales. 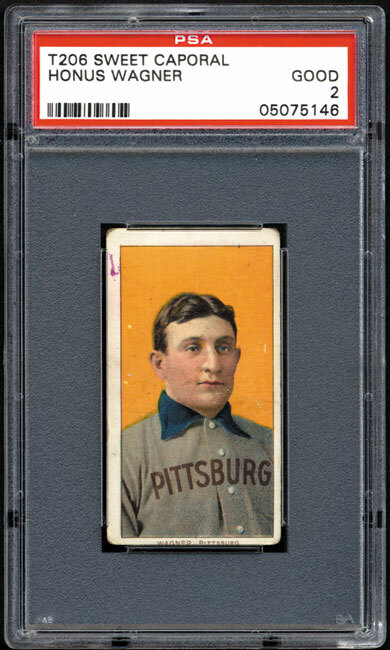 Allegations have been leveled stating that Goodwin and Co. is offering rare Eddie Plank and Sherry Magie cards that have been trimmed like the infamous Gretzky-McNall Honus Wagner card. Grading company SGC says the cards have not been trimmed although, to date, there had never been a Plank with a Piedmont 150 back that had been given a number grade. -Dan McKee has called for some additional provenance information from Goodwin, but it appears they are only willing to say that the card ”has not been in circulation for “at least” 30 years, safely tucked away in our consigner’s collection.” The consignor is Houston businessman David Finkelstein. 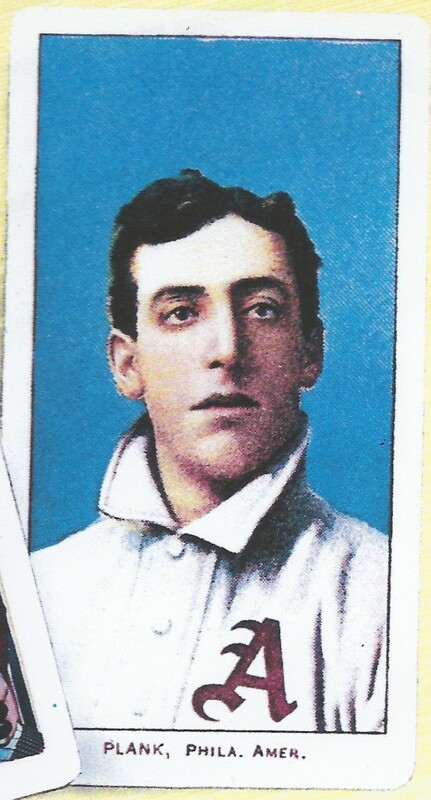 Could T206s like this Eddie Plank have been trimmed down for grading purposes? Where's this Plank today? -Hauls of Shame has compiled images of over 70 existing T206 Plank cards including several that have not appeared in public as graded examples by either SGC or PSA. It appears there were some oversized “Jumbo Planks” documented in the past few decades and sources indicate that some of these examples could have been trimmed down to mimic a factory cut unlike the existing Piedmont 150 Planks that have been hand cut from sheets. -A Mathewson single signed ball appeared on the Heritage auction preview for a month or so, but never made it into the auction. Wonder why? It looks exactly like several others previously authenticated by the TPAs. Did it get shot down? 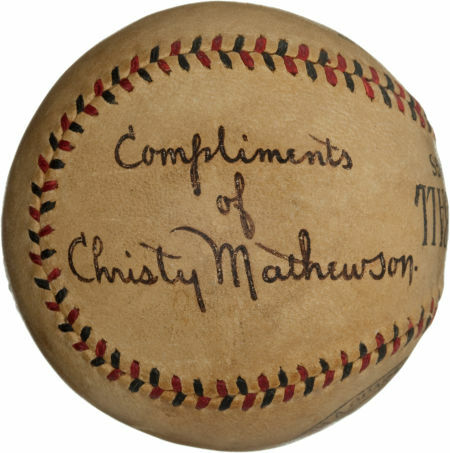 This alleged single signed Mathewson ball appeared on the Heritage preview but never made its way into its Spring sale. That’s quite a description of the Mathewson testimonial event at the Polo Grounds in 1921. There’s just one big problem: The New York Times reported that Mathewson never attended the event and was confined to a sick bed at his home in Saranac Lake in the Adirondacks. Matty sent a message to his friends “through the committee in charge of the testimonial.” The ball comes with a JSA LOA. Look out for our upcoming reports on Mathewson autographed baseballs. Experts question the authenticity of this Ruth ball offered by Hunt. -Babe Ruth balls have also flooded the Spring sales and suspect specimens abound. We’ve been inundated with inquiries questioning the authenticity of the Ruth ball gracing the back cover of the Hunt Auctions spring catalog. Lots of head scratching on this one authenticated by JSA. The signature exhibits stoppages, uneven flow and the appearance of possible enhancement of a signature beneath the jet black india ink that is now visible. The current bid on the ball is $19,965. 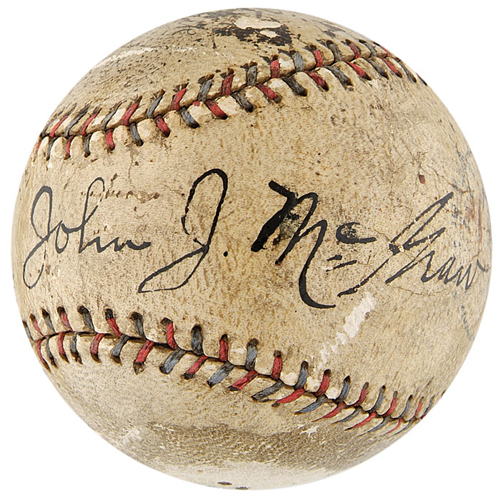 This JSA certed ball features an enhanced and gone-over signature of John McGraw. -REAs current auction features an enhanced and gone over ball advertised as the genuine article with an LOA from JSA. The ball features gone-over signatures of John McGraw, Miller Huggins and Pat Moran. 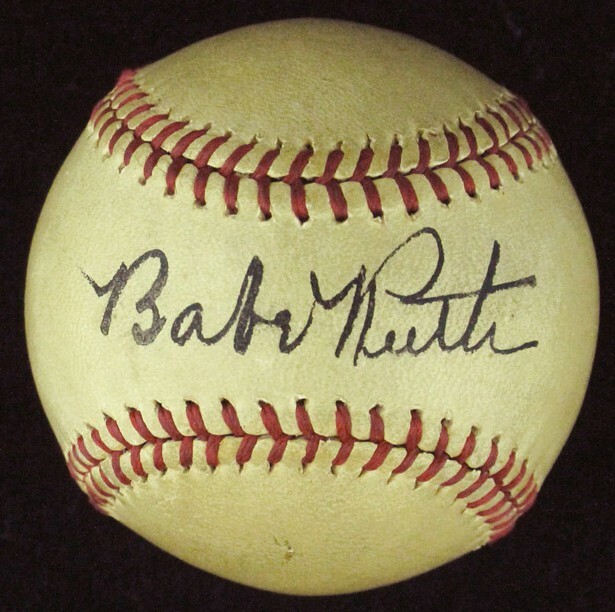 Evidence of the tracing is clearly apparent with the side panel featuring an unaltered Babe Ruth autograph that JSA calls a “classic clubhouse signature” of the Bambino. The signature JSA calls a "classic clubhouse" of Babe Ruth is unaltered, unlike the others on the ball being sold by REA. Be on the lookout for additional reports about problematic items in the Spring auctions of 2012. On the Cobb, such incompetence is unacceptable. Once again the head of the pack at PSA bury their heads in the sand. The hobby needs to wake up on self proclaimed experts. Thanks for the report…keep up the investigative work! Donavon Arabie has gone into hiding on the hobby forum Net54 and has just left the questions unanswered about the Ty Cobb cut. 1- Did PSA get fooled on the Cobb cut by a great forger, as Donavon has stated? 2- Did PSA get fooled on the Cobb cut by a computer printer? 3- Did Donavon tell us the truth on anything in this matter? 4- Does Donavon still have the cut? 5- If not, what is the fate of the cut? 6- Did Donavon actually send the cut back to PSA for reexamination? Does anyone think this Cobb cut is only one of a kind? 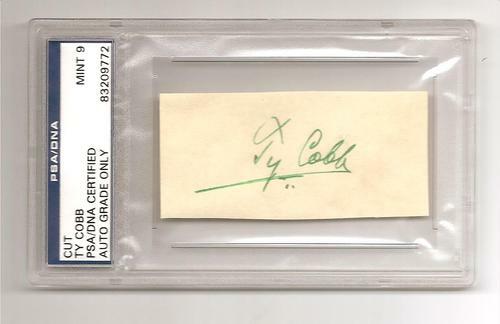 Does anyone think that the person who created this Cobb cut,then got it slabbed by PSA, has stopped at only one? ?